In the third class of a free, grant-funded, healthy cooking program I co-teach in Boston, my colleague and I focus on satisfying soups and side dishes. 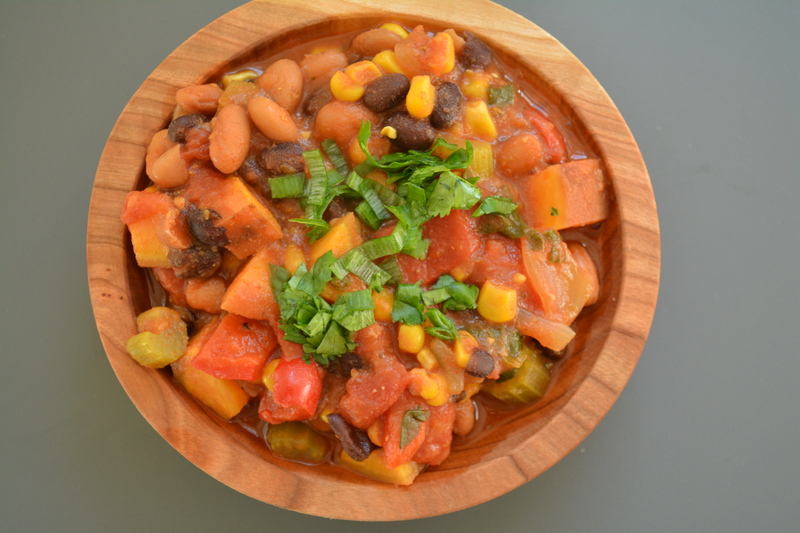 In the class, we prepare a fabulous vegan vegetable bean chili that is super nutritious, affordable and filling. It has 231 calories per serving, 115 mg of calcium, 4 mg of iron and lots of dietary fiber. Unlike a meat chili, it doesn’t contain any cholesterol. (Plants don’t contain cholesterol). And it costs $1.43 per serving to prepare. To supplement the lessons we teach in the class, I made a YouTube video showing the preparation of the chili. I often hear from cooks that they find it help to have a visual guide in the kitchen with them. That’s where a cooking video like this comes in. Do you find it helpful? I’d love to hear from you. Heat a few tablespoons of water in a soup pot over medium-high heat. When the water begins to sputter, add the onion, bell peppers, celery and sweet potato, and cook, stirring for five minutes, adding a little water as needed. 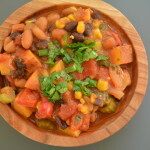 Stir in the tomatoes, broth or water, beans, corn, chili powder, oregano, garlic and cumin. Reduce the heat to medium-low. Cover and cook, stirring occasionally, for 25 minutes, or until vegetables are tender. Stir in the greens. Serve as is or garnished with chopped cilantro, hot sauce, scallions and/or avocado. Feel free to add more greens (kale or spinach), if you like. To reduce cooking time, microwave the diced sweet potato for 1-2 minutes before adding to the pot.